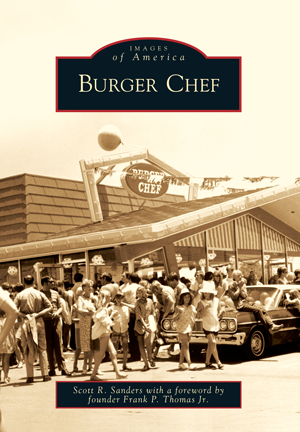 By Scott R. Sanders with a foreword by founder Frank P. Thomas Jr.
Frank P. Thomas Jr., Donald J. Thomas, and Robert E. Wildman, owners of the General Equipment Company, entered into the fast-food business by opening a 15¢ hamburger restaurant called Burger Chef in Indianapolis in 1958. General Equipment was a manufacturer of restaurant machinery and built the equipment installed in each Burger Chef store. The partners started their new Burger Chef division to sell more equipment; they never could have imagined that Burger Chef would eventually grow to become the nation's second-largest hamburger chain and beloved by customers in towns and cities across America. Burger Chef continued in business until 1982, cooking its popular flame-broiled hamburgers and introducing its memorable advertising icons, Burger Chef and Jeff. Scott R. Sanders has been a collector of Burger Chef history, advertising, and ephemera for over six years. He is an elementary teacher for the Alvin Independent School District in Alvin, Texas. Burger Chef is a photographic history of the famous hamburger chain that contains rare images from Winthrop University's Louise Pettus Archives and the Hazel Park Historical Society, as well as the personal collections of its founders, the author, and others.